Will be interesting to see what it sells for. Interesting. Erb made mp38 tubes? Is that a on/off safety notch in the charging slot? Many/most MP-38's were retrofitted with the 2 piece charging handle......along with the required cutout made in the charging handle slot. Pics of original, correct MP38 to compare. sorry about upside down pic. Tried to fix it but it didn't work…. Edited by Black River Militaria CII, 02 April 2019 - 05:22 PM. I posted the seller and asked who is listed in the mfg/imp box. Also asked for him to look on the inside of the tube to see if there is a buttweld seam under either of the overstrap loops that are part of the magwell. The tube looks original to me and either was cut and welded, or not cut and registered or a reactivation in my opinion. Will see what the registration says. The numbers on this gun look correct and original to me and the vintage style stamps that Erb made to stamp his own work are quite different than these. His "Erb" logo is used on a number of MP40s but shows up stamped in different places on the receivers, sometimes on the forward end of the receiver under the serial. Bob...does the original MP38 receiver have grooves on the inside of the tube like the MP40?? Also its strange that this tube has the safety notch cut but yet it has an original numbers matching hook style bolt and firing pin. I guess the hook could have been reinstalled on the bolt after the safety style charging handle broke. As for the matching bolt. If it was changed to the 1941 style mp40 why would a soldier keep the original bolt? Its a mystery as to why the bolt matches and the notch is cut. Maybe they modified the bolt and then erb modified it back ? A few pics down the tube is whats needed. Edited by huggytree, 02 April 2019 - 07:25 PM. So its possible the MP38 is smooth on the inside but like Bob said if there are no welds it could be a real matching MP38 that erb re manned and stamped his name on It. Edited by Petroleum 1, 02 April 2019 - 07:47 PM. From the seller: the registration notes Erb as the Mfg/Imp. If Erb imported the gun prior ot the end of the 68 Amnesty, he did not need to mark it, but it is marked, his name is listed as mfg/imp so it is a reman gun. Now, was it properly cut and welded per regulations for legal registration? That question is pending. An original cocking handle could well have been reassembled to the bolt by Erb to restore the gun to correct original specs. I have replaced original cocking handles on the converted bolts of one MP38 and one early MP40 at the customers request. No big deal. Edited by Black River Militaria CII, 05 April 2019 - 10:18 AM. It looks to me like a gun that was never actually cut and it was just stamped with the info and "manufactured" then. I'm the seller and this is a Registered Erb Tube. I spoke with Mr. Erb several years ago and he confirmed producing MP38 Tubes. He told me that he had several people working in his shop around the clock to make as many Receiver Tubes as possible, to register before the cutoff. Charles Erb has his name and the registered Serial Number on this tube. That serial number is the number that is on my FORM 4. As I explained to Black River Militaria, this tube can be switched over to another MP38 Parts Kit if someone wishes to do so. The only thing registered with the ATF is the Receiver Tube. It just so happens that this Receiver Tube was attached to a very nice, all matching, parts kit by someone before me. The ATF has a record of this tube, not the gun, and can show its history of transfer since Erb registered it. I don't appreciate someone spreading their "opinion" that my gun is illegal. I don't need to be an expert as to what qualifies as a "tube gun" to know that it's only the tube that is registered, just like a drop-in sear pack for an MP5 or similar gun type. Only the trigger pack / sear is registered. The sear pack can be placed in any gun that can accommodate it and is legal. The registered tube for this MP38, or any MP40 would work the same way. First, apologies if I have stepped on your toes, vice guy, with my "opinions", but I am not out to create problems, only to try to solve them. There is an old expression that is germane here: buy the gun, not the story. 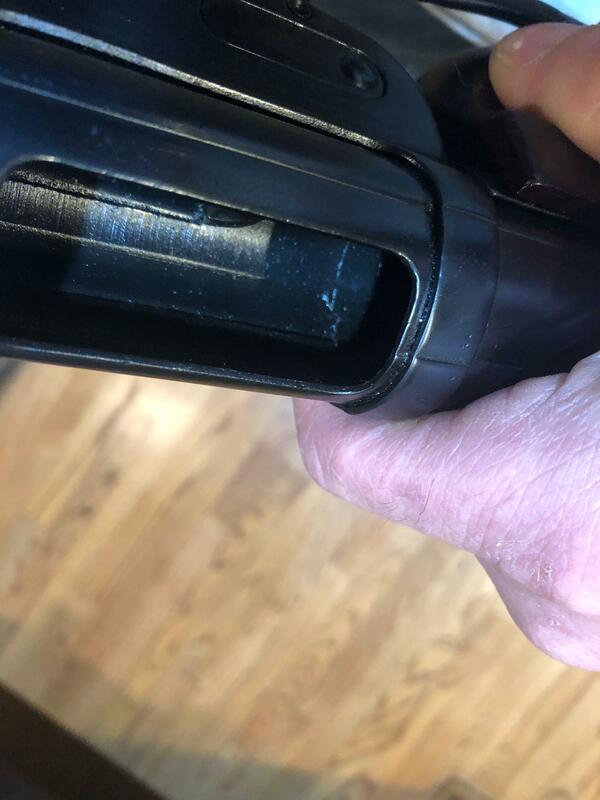 The pics you posted of the gun advertised on a public auction forum show a number of characteristics that raise legitimate questions from prospective bidders about what receiver tube was registered and how it was processed for registration. The posters on this forum are prospective bidders and also raised some questions along with others who sent me e-mails asking for my opinion about the provenance of the receiver tube. Of course my response is just my opinion, but I am asked for my opinion because I have many, many years of experience with these SMGs and many others as well, and also many years of experience with the MG registry, and the methods and complications of the registrations of remanufactured MGs. These questions are commonly asked about many, many different types of MGs offered for sale and the purpose is to understand exactly what are the facts about the MG being offered. There are specific, established facts about registration procedures and protocols and if an MG has characteristics that appear to conflict with the registration protocols then questions are raised about what actually occurred. I am trying to find out the facts about the history of the registration of the receiver tube of your MP. In response to your post to me, I returned a reply to you with an analysis of what appear to me to be legitimate issues that need answers if a buyer is to have confidence in the provenance of the gun he is buying. This kind of inquiry is necessary and most buyers seek such answers. What I posted above is one of a number of plausible explanations, and there are several, for the conflict between the characteristics of the receiver, its source and the protocols for registration of the receiver. Please read my post to you and reply to me at my e-mail address. I love the MP38, and I wouldnt mind getting a second MP38, but the markings on that tube look totally factory. Im no expert, but just my opinion. Never seen an Erb tube in person though, but if those are his markings, damn he was good. Edited by michaelkih, 04 April 2019 - 01:15 AM. First, thank-you Bob for your expert analysis and opinion, which I have found to be invaluable. Please keep doing what you do. From the above posts in this thread, I take it the issues are (1) did Erb make MP38 tubes, and (2) because any MG could have been registered during the 1968 Amnesty there were no tube guns prior to 1968 (am I correct on this point?) and after 1968 to be a re-manufactured MG an original receiver would have had to have been cut ("destroyed") but could have then been re-welded by a manufacturer like Erb (or he could have made MP38 tubes). So there is a possibility that there was an original uncut receiver that was not registered but then "re-manufactured" by Erb? In other words, he or anyone else who manufactured MGs before 1986 could have taken an original uncut receiver, that was contraband, and "re-manufactured" it? The only way to know would be evidence that the receiver had been previously cut and then re-welded when "re-manufactured." Or he could have used a registered tube that he made. Have I got that correct? I hadn't thought about that possibility, so if I got it correct I learned something today. Just trying to understand the possible issue(s). It seems clear to me from the above posts that this may well be a re-welded or tube gun but it would require further inspection to definitively determine. FWIW, I do think it is a very nice looking gun, and in my mind a Erb tube gun, especially an MP38 (assuming he made MP38 tubes), would be nice to own. One thing that does appear to be in question is whether or not Mr. Erb made MP38 tubes. Seems like that could be readily verified somehow or another. The seller seems certain it is a Erb manufactured tube gun. It seems like if Erb was making MP40 tubes he would have made some MP38 tubes too, although I guess the MP38 parts kits have always been in short supply versus MP40 parts kits. I don't recall ever seeing an Erb MP38 tube gun before. Maybe others have? The owner could also dissemble the gun and remove the mag well to show no weld. ive never heard of an erb tube gun...cant someone call erb to see if he made any..isnt he alive still? id recommend a couple of pics from the angles below to prove there is no cut line. 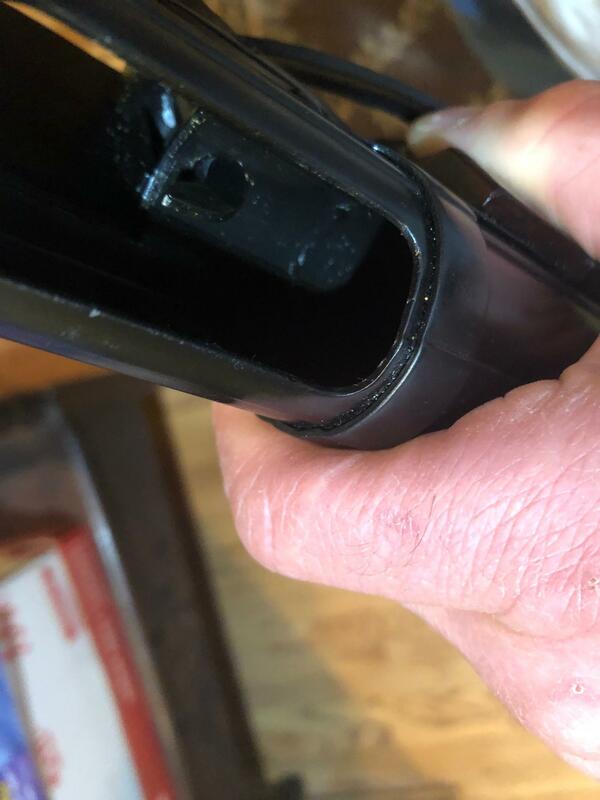 pics of my weld seam inside my tube...looking from the back and holding it up to the light i cant see this weld, but through the ejection port its very clear. Edited by huggytree, 04 April 2019 - 07:28 AM. As the owner of the Erb MP38 in question, I would like to apologize to the forum for the response I posted above. I didn't thoroughly read all of the listed postings and the personal message that was sent to me from Bob at Black River. I sent him an e-mail response this morning and the actions that I am going to take to resolve this issue. If possible, I'll try to post a copy of that response I sent to Bob. I value and respect his opinion, and those of this forum, regarding the stampings at the front of the receiver. I will be removing and/or ending my GB listing for the MP38 until I get this issue resolved one way or the other.